i-manager’s Journal on Wireless Communication Networks will focus on networks extremely portable because of digital modulation, adaptive modulation, information compression, and access multiplexing. Wireless networks are generally implemented and administered using a transmission system and this implementation takes place at the physical level of the network structure. 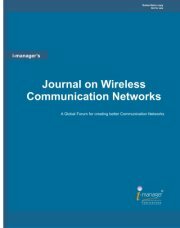 The Journal aims to focus on high quality papers from academia and practitioners in all areas of Wireless Communication Networks. The Journal follows a double blind peer-review process. The submitted articles / research papers are reviewed by Professors/Educators in Wireless Communication Networks. Academicians, practitioners and post-graduate students in the field of Wireless Communication Networks, University Educational Bodies and Researchers.